Across Georgia, many homeowners are looking to create dynamic designs that refresh their houses and give them a new outlook for the future. Modern home renovations have made the process of designing and upgrading your property a rewarding and cost-effective venture. The beauty of this process can be seen in the many different styles and floorplans across the state. Those imagining an all-white kitchen for a contemporary and clean look may find it challenging to achieve the right level of color without making things feel too impersonal. Our home remodeling contractors are here to provide impressive results for every project, and our expertise ensures that you will be happy with the results. 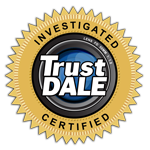 While we specialize in cabinet refacing services for Atlanta homes, our team is perfectly capable of delivering complete quality for every project. We can incorporate services such as cabinet resurfacing — for clean, smooth, white cabinet doors — to deliver an affordable outcome that matches your vision. Today, we’ll look at a few tips that may prove useful in planning your kitchen remodel. If you’re looking for home remodeling services such as custom cabinets, surfacing, and more, be sure to call us to schedule your consultation! 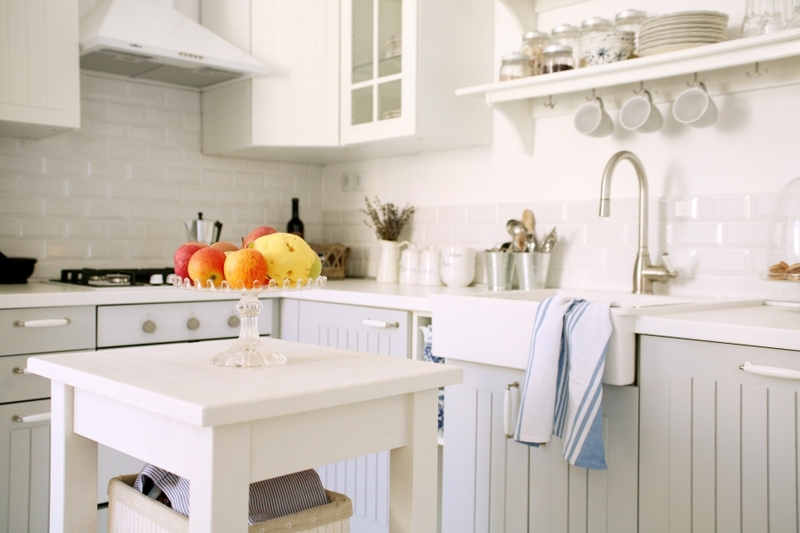 A white kitchen can look great, but many people fail to realize how sterile their space will feel if the entire room is covered in the exact same shade. One color will only create a flat look, providing little definition and space. Even minor changes in hue can result in big outcomes, as most kitchen designs benefit from unique visual outcomes and captivating details. From the kitchen cabinets to the floor, every surface has the potential to increase the contrast in your one-color kitchen. One thing to consider before combining a paint plethora for your Georgia kitchen is the tone of whites used. Most paint experts will provide their collection of tones in either warm or cool tones, as each category results in a different look. Cool tones tend to look more blue while warm tones appear more yellow on the other end of the spectrum. Detail Design & Remodeling is here to provide design support in addition to our kitchen cabinet refacing services. We can work with you to find the right color combination. One of the biggest advantages of relying on white hues for your kitchen is that it will do wonders when reflecting light within the room. White kitchens are often designed to look spacious and airy, which can only be enhanced by making the best use of any natural light available. Even more minor skylights and sink windows can become a focal point for light, making your space feel more natural while also reducing the need for artificial light. White kitchens that introduce different materials can benefit from additional contrast and depth within the space. You will have the chance to install new floors, appliances, and a backsplash, providing an ideal time to create drama with conflicting surfaces for the best effect. A grainy wood floor, for example, can do much to contrast with the sheer white surfaces everywhere else. Not only will this increase the value of your kitchen, it can help to reduce the glare from the reflectivity of white finishes. While many homes look good sporting a futuristic all-white combination, the truth is that many homeowners prefer a little splash of character to make their space feel more comfortable. The kitchen provides a vast range of options in which to insert your accent colors, including the light fixtures, cabinet hardware, furniture, rugs, appliances, and more. Nearly every piece of your kitchen can be procured in a bright color, working effortlessly with the versatility of your ivory color scheme. Larger kitchens can benefit from introducing two or even three accent colors to highlight the depth and versatility of the space. Dynamic color combinations can do wonders to enhance your space, whether you’re hoping to designate different work areas or highlight your beautifully refaced cabinets. 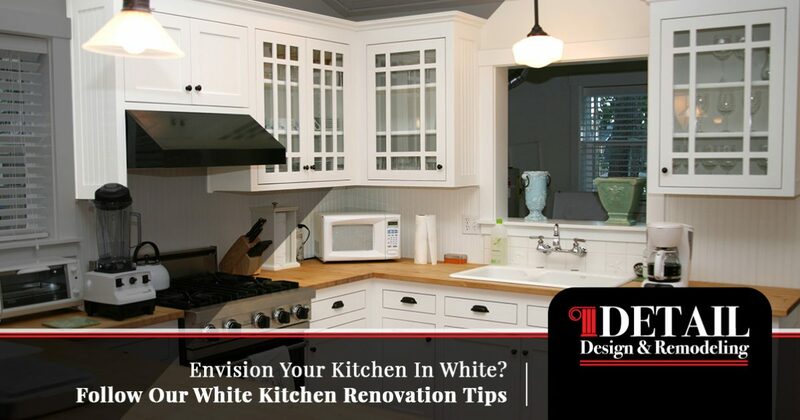 When remodeling an all-white kitchen, it’s important to continually look at the end result, not the current fixture or surface. Homeowners who take a step back can make sure that their kitchen looks balanced and inviting, not stark and cold. If your kitchen cabinets look blank, try replacing the hardware for a bold outcome. When working with white, small changes can result in big outcomes, so be sure to check your progress every step of the way! Covering your cabinet fronts with white paint may sound simple, but keep in mind that there is a very low tolerance for error with this shade. Detail Design & Remodeling has the skills and equipment needed to provide cost-effective outcomes for Georgia homes that are both beautiful and long-lasting. You’ll be left with seamless cabinet boxes and doors ready to be outfitted with hardware to create a robustly qualitative outcome. Contact us today to learn more about our home remodeling services, and be sure to contact our cabinet refacing team in Atlanta to see how we can enhance the outcome of your white kitchen design!